Ann Macklin was born at the Kathryn Prittie Hospital in Grande Prairie in 1917, the daughter of David and Annie Philips-Roberts. Her father had homesteaded in the Clairmont area after coming over the Edson Trail in 1912. David Philips Roberts was the only son of Mr. E.M.Roberts, J.P. in Talsarnau, Merionethshire, Wales. Born in 1877, he had spent some years in Austrailia before coming to the Peace Country. His homestead was called Trevor Farm. He also worked out on a road gang building the Dunvegan Hill road ca. 1914. In 1916, his fiancé Annie Roberts, a nurse and matron of a hospital in Wales, came to join him and the couple was married in Grouard on January 26, 1916. They spent their honeymoon traveling to Clairmont in a caboose pulled by two oxen. Growing up on the homestead, Ann attended Clairmont school, then high school and business college in Grande Prairie. An only child, she enjoyed all her pets as well domestic animals on the farm, recording each one by name. After the war Ann married Victor Macklin, son of I.V. Macklin (the first school teacher in Grande Prairie). David Philips-Roberts passed away Feb. 23, 1948 and is buried in the Grande Prairie Cemetery. Annie Roberts moved to Ottawa where Ann and Victor lived and where the couple resided for their entire married life. Ann Macklin passed away in 2003. The records were donated for reproduction by Tillie Macklin Gordon, second wife of Ann's father-in-law, I.V. Macklin, in 2005. 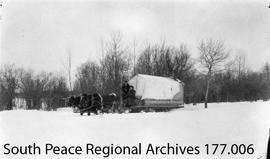 The fonds consists of colour copies of 96 photograph album pages which have been laminated and bound into an album for display in the Grande Prairie Museum; and 90 digitized scans of photographs which have been printed. Subjects of the photographs include the trip to Clairmont by caboose in 1916, Trevor Farm and animals, photographs of people and groups in the Clairmont area including United Farm Women and the I.V. Macklin family, Fletcher and Anna Bredin and their farm Twin Shacks, road gangs building the Dunvegan Hill Road, Ann as a child and teenager on the farm, a trip to Aurora Ontario, students at Grande Prairie High School and Grande Prairie Business College ca. 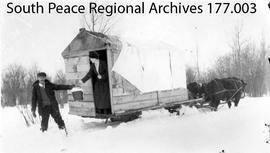 1935, and a pack trip to Nose Mountain in 1935 with two Cree families as guides and providers.